It has been over ten years since Richard Lees first visited India as an eighteen year old, taking a year off from education to travel across the country he had long desired to explore. Today he spends half a year in Goa working with Goan NGOs and supplying them with volunteers through his company Volunteering Goa Limited. So just what is a British national doing spending his time between two countries rather than pursuing a profitable career in his home country? It was that initial visit to India that allowed the idea of charity work to take root in the young man, albeit subconsciously. Before beginning his studies in chemistry at the University of York in the UK, and during his tour of India, Richard came in contact with Thomas Mathew and his non-profit organisation SEEDS that provides aid, skills training and guidance to widows in Kerala. After spending a few days in Kerala, Richard would go on to help the organisation by selling items made by the widows in the UK, and he quickly became friends with Thomas Mathew. The memory of Goa lingered on in Richard’s mind. ‘Just seeing Goa for a few days during my first trip, I found there was more culture here and people were so welcoming and friendly. I was determined to come back and spend more time here,’ says the thirty year old. On completing his PGCE (Post Graduate Certificate in Education), he had no opportunity to take up a teaching job immediately. He used that time to journey to India: this time focussing on Goa for about 6-8 weeks. The friends he made in Goa drew him to NGOs on a personal level. Richard went on to become closely involved with Mother Teresa’s Roses, a religious order of nuns, and realised there were a range of issues Goa was grappling with. What the NGOs needed primarily was skilled and practical help, as most were understaffed. The foundation was laid by setting up the Goa Anglican Centre, a UK registered charity (registered charity 1152714), to facilitate volunteering at the lowest possible cost. As the name suggests, the Goa Anglican Centre brings together Christians of various denominations to pray for the volunteers and the charities they work for. It furthermore undertakes fundraising events to supply volunteers with bursaries. 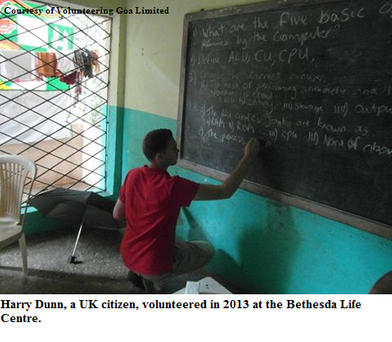 Volunteering Goa Limited, which is a registered company in the UK, was born out of the Goa Anglican Centre because those people who could pay a sustainable amount began applying, and as a charity Goa Anglican Centre was unable to collect any fees. Another reason for the establishment of Volunteering Goa Limited in 2012, was that an obvious Christian connection would deter potential non-Christian volunteers. Volunteering Goa Limited has since had its volunteers work for Mother Teresa’s Roses, the Bethesda Life Centre and Don Bosco Konkan Development Society, caring for the orphans, abandoned and abused children housed by these different organisations. Volunteers have ranged from John Dye, who is in his seventies and has come back more than once as a volunteer, to several young people aged between 17 and 28 years. ‘My experience with the volunteers has been interesting,’ says Richard, ‘I have seen the huge impact the volunteers have made and I have also seen the huge impact on the volunteers.’ The volunteers have had a change in perspective after working in Goa and since most are in the teaching profession, the immense pressure they face in working with these NGOs has helped them develop in their careers. The children benefit the most as language fluency and confidence develop and strengthen through contact with the volunteers. The staff at the NGOs are often unable to provide the same family atmosphere to the children due to lack of time. The volunteers have succeeded in drawing out the individual characters of the children by devoting their time and energy to them. In its early days, Richard had envisioned Volunteering Goa as a company that had scope for expansion to the capacity of larger volunteering organisations. However, time and experience have given evidence that Volunteering Goa functions at its optimal level in ushering in positive change as a smaller and more personal organisation. There have been volunteers who might have not volunteered at all if it meant joining a large organisation, owing to their inclination towards being introverted. Yet, these are the volunteers who are able to give a personal touch and thus contribute in a much more fruitful manner than volunteers who generally opt for bigger companies. A smaller number of volunteers also ensures that the volunteers are not limited to socialising within the circle of their own countrymen. ‘A smaller number allows them to integrate with the local culture to some extent. 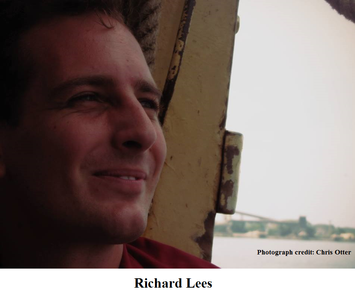 I prefer to keep it small and not develop it into a large corporate entity,’ says Richard with his typical genial attitude. 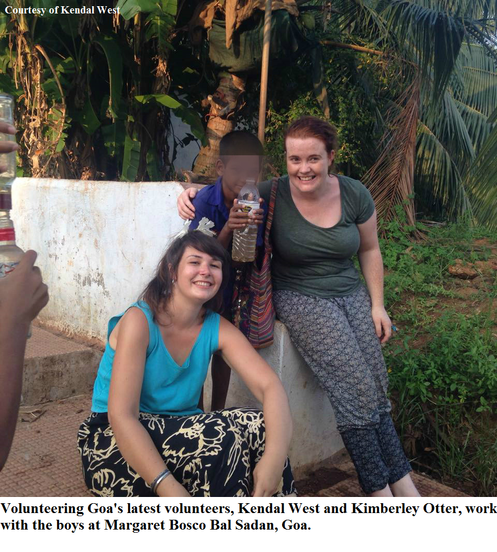 Volunteering Goa offers placements depending on volunteer interests, in a number of different NGOs. Volunteers have days out too, where they can take in the culture and history of Goa. For more information about Volunteering Goa Limited, please visit the website: www.volunteering-goa.com.